the bodhisattva cast in high relief, shown standing against a lotus-petal-shaped mandorla decorated with a wide border of flickering flame motifs, wearing a high crown tied with ribbons at the back, and with long wavy hair falling down behind his ears with extended lobes, his face with well-defined features including almond-shaped eyes under arched brows and a small mouth set in a benevolent smile, with a plain halo behind the head and two inner borders of undulating parallel lines radiating from the body, suggesting the emanation of brilliant energy, wearing a long celestial scarf draped over his shoulders and billowing out to either side, holding the lotus-bud in his raised right hand and a kundika bottle in his left hand extended down at the hip, his bare chest adorned with a pectoral and a pendant, framed by long beaded necklaces crossed over his abdomen, the legs covered with a dhoti gathered at the hips and falling in stylized rippling folds to his ankles, his bare feet resting on a low plinth above a domed base decorated with double lotus-petal lappets, all raised on an integral stand with four wide corner-angle legs, the surface very well preserved, with dark reddish-brown patina and scattered areas of green corrosion. 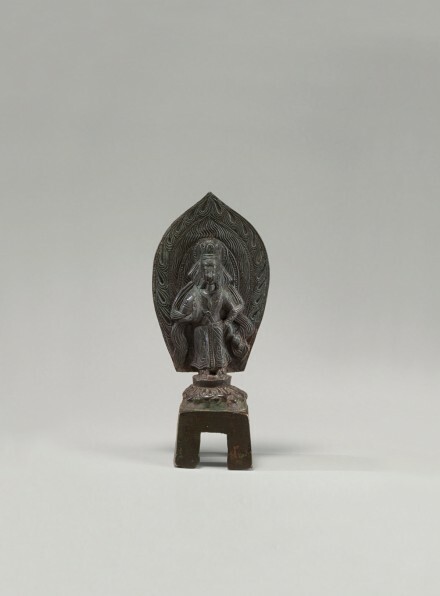 A small Northern Wei gilt bronze votive figure of Padmapani showing many stylistic elements in common with the present example and inscribed with a date corresponding to A.D. 513 is illustrated by Matsubara in Chūgoku Bukkyō chokokushi ron (Historical Discussion of Chinese Buddhist Sculpture), Tokyo, 1995, vol. I, no. 138. Another small Northern Wei gilt bronze figure of Padmapani stylistically similar to the present example in general form and selected details and inscribed with a date corresponding to A.D. 492 is illustrated by the same author, ibid, vol. I, no. 73. Compare also the related gilt bronze figure of Padmapani, inscribed with a date corresponding to A.D. 484, in the collection of the Asian Art Museum of San Francisco, illustrated by René Yvon Lefebvre d’Argencé in Chinese, Korean and Japanese Sculpture in the Avery Brundage Collection, San Francisco, 1974, pp. 68-69, no. 20.